Gluten friend or foe of your heart? Yet another sound bite of medical information hits the press as we are bombarded with snippets of information to leave us perplexed by a quick grab take-home message. In the last days, media coverage has flagged a link between gluten and heart attacks based on a study that was run over a 26 year period with approximately 110,000 U.S. health professionals. Researchers apparently came to the conclusion that there is possibly a link to increased risk of heart attack by omitting gluten from the diet. This was apparently not related to the gluten itself, rather a result of the decreased consumption of grains or other grain-based products that could be associated with gluten consumption. Reducing ingestion of these products possibly resulted in reduced amounts of fibre but it may have also had an impact on the composition of the food consumed, and possibly lead to foods with more sugar or unfavorable fats. Those details are not clear from the initial reports in the media. What seems to be able to be concluded from the study is that if you are looking to reduce gluten for cardiovascular health then it’s not necessarily going to provide that result. If you are looking to reduce gluten for symptomatic reasons like bloating, better digestion and better sense of well-being than that is altogether fair and reasonable but don’t expect a reduction of risk of heart attack. 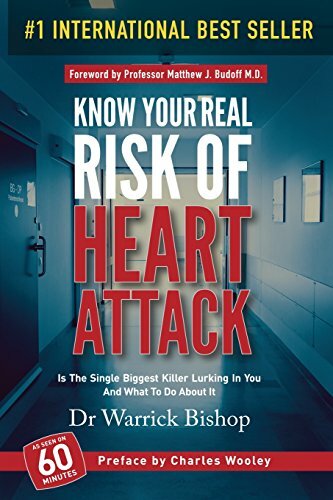 If you want to have a better handle on your cardiovascular risk and health then instead of skipping on the gluten skip along to your local doctor and ask about what technology is available these days to look at the arteries and see what risk you really may have when it comes to coronary artery disease. You may find my book on this subject useful. I hope you have enjoyed this titbit over your piece of toast in the morning, whether it is gluten-free or not. Good health!